The Leonard Street Gallery presents an exhibition of photomontage entitled Blairaq ’by ‘Unofficial war artist’ Peter Kennard and collaborator Cat Picton Phillips, from 22nd June – 12th July 2007. Blairaq contains almost exclusively new work – including pieces made using censored Iraq war photography obtained from the newswires. 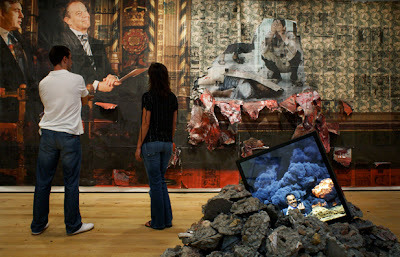 Amongst several oversized portraits of Blair features Photo Op, the piece chosen by Banksy to front his seasonal Santa’s Ghetto showcase in Christmas 2006. Banksy, who recently won the ITV Greatest Living Briton award in the arts category, regularly cites Kennard as a major influence. Kennard’s 1980 work Haywain with Cruise Missiles will be available as a limited edition print during the exhibition.